I have a lot of passion for the finer things in life: homemade sauces, garlic knots, globs of ricotta cheese. Fiore II in downtown Middletown provides all of this and more. I recently visited this fine establishment, tucked away at the corner of Court and Main St., in an attempt to impress my wonderfully pleasant date for the evening. In an ironic twist of fate, though, it was I who was impressed—so impressed that I feel obligated to tell all of you about my experience and offer you some tips to make your visit an amazing one. I’d be remiss if I didn’t first comment on the service. I mean, these people were incredible. Every person in the restaurant made an effort to ensure a good experience for us, checking in and making polite conversation as they walked by. Everyone was impeccably well dressed and intimidatingly attractive (in a good way that makes you feel comfortable rather than self-conscious). So tip number one has to do with tipping: you’ll want to tip well here. Of course, you should always tip well just as a rule, but especially here, where the staff goes out of their way to make sure you’re having a good time. Now, onto the food. At Fiore II, in lieu of the stereotypical bread basket, a bowl of freshly baked garlic knots finds its way to your table. These are a delightful surprise as they work incredibly well to mop up the extra sauce on your meal (such a mop is absolutely necessary, more on this in a minute). On their own, they offer a much more exciting starter than what you would normally get at an Italian restaurant; because of this, they disappear rather quickly. Tip number two: when the waitstaff brings out your meal and notices that you have eaten all of the garlic knots, as you inevitably will have done, they will ask you if you would like more. Swallow your pride and say yes. This temporary moment of shame is worth the fresh bowl of deliciously baked dough. As alluded to above, extra knots are absolutely vital when your meal comes. There will be some amazing sauce to be mopped up, and a lot of it. Honestly, I have a lot of feelings about sauce—sauce is my favorite food, just ask anyone who knows me. 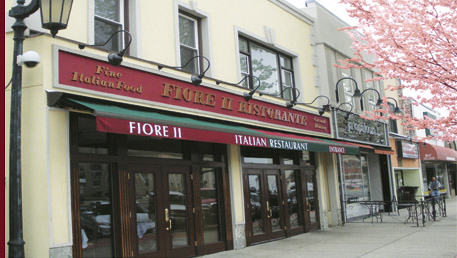 As advertised when you search them on Google, Fiore II boasts house-made sauces that top all of their dishes. And they are absolutely the bomb. Especially in combination with one another. Tip number three: get creative with your sauce allocation. Take your friend’s extra sauce from their lobster ravioli and pour it over your leftover eggplant rollatini. This will be mutually beneficial for both of you, and also ridiculously delicious. Seriously. I encourage you to try that specific combination. These chefs do their eggplant right. Honestly, though, you could pick anything. Everything is just top-notch, and the portions are huge. This leads directly to tip number four, my final piece of advice for the Fiore II experience: take home your leftovers. “Of course I would do that,” you say. And that’s terrific. I just want to make sure, because some restaurants are really solid but the leftover experience is lacking. Fiore’s food, however, is somehow even better after spending the night in your fridge and being eaten the next morning for breakfast. So don’t waste your opportunity to re-experience this delicious food. From start to finish, Fiore II is absolutely worth a trip. Come for the garlic knots, stay for the service. And homemade sauces. And eggplant. If you’re looking for someplace to go in the near future, this is a great choice. It isn’t too expensive, though going there is likely better saved for special occasions, especially ones where the parents are paying. My only qualm is that I can’t seem to find Fiore I anywhere. If anyone knows where that is, send me an email. I definitely want to visit.